Trash Mash-Up would like to give a BIG heartfelt THANKS to City CarShare. City CarShare has been TMU supporters for many years, donating the use of their vehicles for our Mash-Up Bashes. 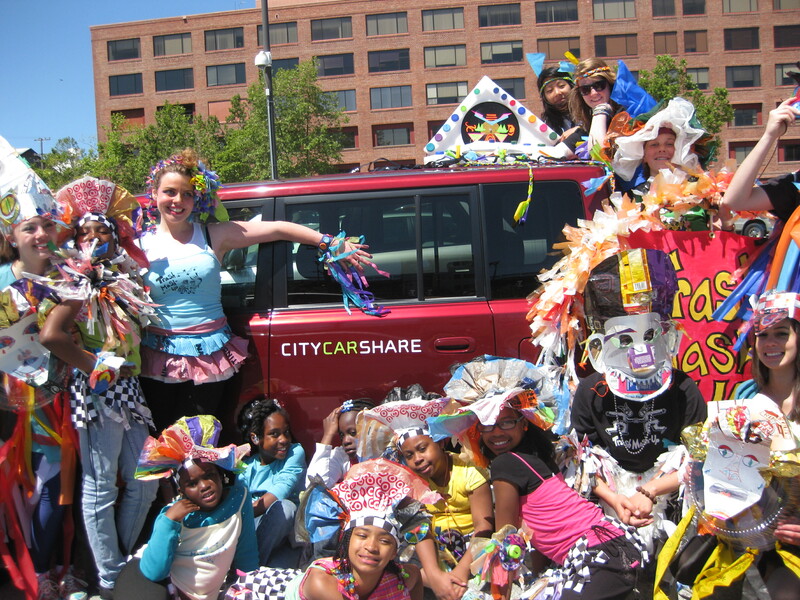 Most recently, TMU used CityCar Share for Carnaval SF. Both Jessie and Bridget McCracken are proud City CarShare members and have modeled for them. City CarShare is your most convenient, affordable option if you don’t have a car but occasionally wish you did; if you already have a car, but don’t drive it every day; if you have a second car that only gets used once in a while; or if your car just “died,” but you don’t plan to replace it. City CarShare is also a great option if you take public transportation, but sometimes need a car; share a household car, but need a second car to taxi your kids around; like to bop around at night or get out of town on the weekends; or operate a business and need a car to help run it. City CarShare is the only nonprofit carsharing service in the Bay Area. They are a local organization with a mission to improve the environment and quality of life in their communities by promoting innovative mobility options. TMU loves them!